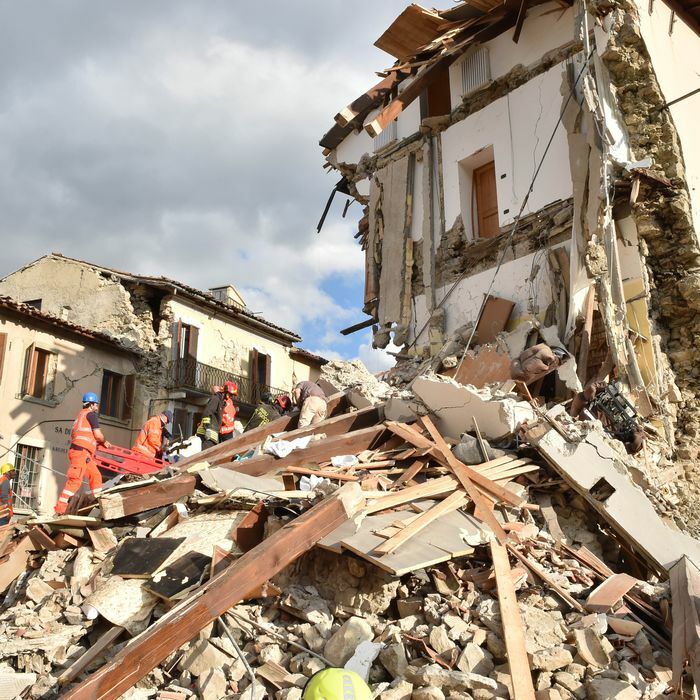 Rescuers clear debris while searching for victims in Arquata del Tronto, Italy. At least 37 people are dead and many more are still trapped under rubble after a 6.2-magnitude earthquake struck central Italy at 3:30 a.m. local time on Wednesday morning. The quake and a series of strong aftershocks were felt as far away as Venice and Rome. The earthquake hit a mountainous region 6.2 miles southeast of Norcia. According to CNN, at least ten people were killed in Pescara del Tronto, six in Accumoli, and five in Amatrice. Sergio Pirozzi, the mayor of Amatrice, told Italy’s state-run radio station that his town “is no more.” “I have an appeal to make: We have access roads to the town cut off and people under the rubble, help us,” he said. “We’re digging, digging … hoping to find someone alive,” said Stefano Petrucci, the mayor of nearby Accumoli. Images from the area show massive piles of rubble blocking ancient, narrow streets and people digging with shovels and even their bare hands to free survivors. The Italian army has been mobilized to help with rescue efforts. Italians have been asked to give blood and donate blankets, medicine, and water. “We need chain saws, shears to cut iron bars, and jacks to remove beams: everything, we need everything,” Andrea Gentili, a civil-protection worker, told the AP. The initial earthquake was followed by at least three aftershocks as strong as a 5.5-magnitude. The European Mediterranean Seismological Center recorded the earthquake as a 6.1-magnitude while the United States Geological Service says it reached a 6.2-magnitude. The death toll is expected to rise. A similar earthquake in 2009 killed more than 300 people.